He's said to be enjoying visits with old friends, holds daily conference calls with his staff, has a new book coming out and documentary in the works, and is even dictating plans for his funeral. U.S. Sen. John McCain is apparently still showing signs that garnered him the moniker "The Maverick." Add John McCain as an interest to stay up to date on the latest John McCain news, video, and analysis from ABC News. The 81-year-old Arizona Republican, who was diagnosed with an aggressive form of brain cancer last year, is still giving the straight talk he's been known for to anyone who will listen. McCain's son-in-law Ben Domenech said on Sunday that the former GOP nominee for president is "talking, he's chatty and he's walking around." Sen. John McCain receives the 2017 Liberty Medal from former Vice President Joe Biden at the National Constitution Center, Oct. 16, 2017 in Philadelphia. The veteran senator is "very grateful for the chances and fortune that he's experienced in life," Domenech, who is married to McCain's daughter, Meghan, told CBS's "Face the Nation." The update on McCain's health came about a week after Domenech tweeted, "John hugged me tonight. He asked me to take care of Meghan. I said I would." "He's reflecting at the end on a lot of different things," Domenech said Sunday. "We appreciate all of the support that we've been given by a lot of different folks who have come out and met with him over the past couple of weeks." Sen. John McCain addresses the Brigade of Midshipmen at the Naval Academy in Annapolis, on Oct. 30, 2017. Among those to visit McCain at his ranch in Cornville, Arizona, was former Vice President Joe Biden, McCain's wife, Cindy, tweeted on April 30. Enjoyed a wonderful visit from @JoeBiden yesterday. Such good family friends. Enjoyed catching up! 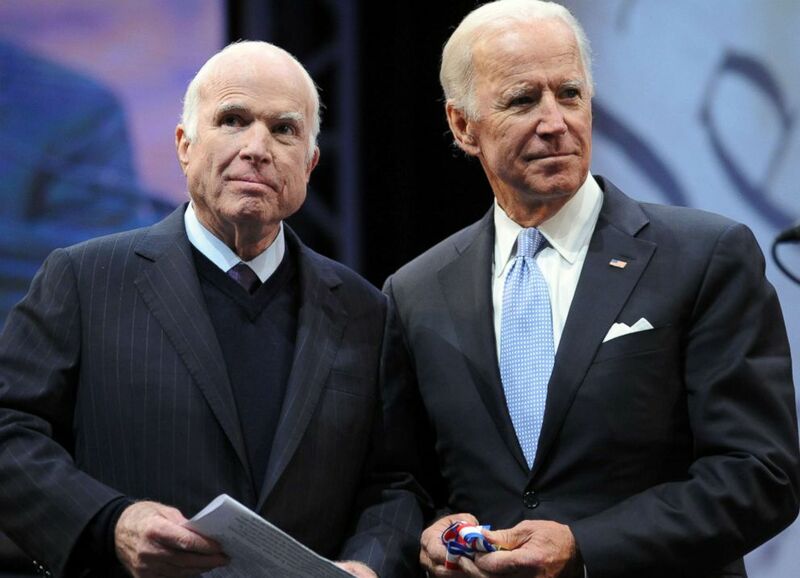 McCain reportedly encouraged Biden, 75, to “not walk away” from politics, Biden told the New York Times. "Here John knows he's in a very, very, very precarious situation, and yet he's still concerned about the state of the country," Biden told the Times. "We talked about how our international reputation is being damaged and we talked about the need for people to stand up and speak out." 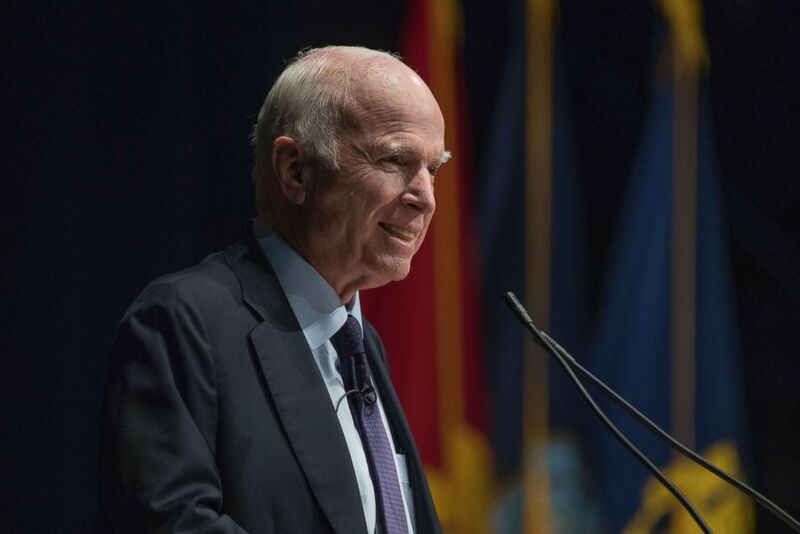 McCain, a former Navy aviator who endured 5 1/2 years as a prisoner of war Vietnam in the 1970s, was diagnosed in July with a form of brain cancer known as glioblastoma. McCain hasn't been seen in public since December. He underwent surgery in April at the Mayo Clinic in Phoenix after contracting an intestinal infection. He has also been planning his funeral, telling aids that he wants former presidents George W. Bush and Barack Obama to speak at the service, according to an NBC News report published Saturday. But McCain is adamant that President Donald Trump not be invited to the funeral, according to the report. During Trump's campaign for president, he mocked McCain for getting captured in Vietnam, saying, "He's not a war hero. He’s a war hero because he was captured. I like people that weren't captured." In an excerpt from his upcoming book, obtained by ABC News' "Good Morning America," McCain writes of Trump, "He has declined to distinguish the actions of our government from the crimes of despotic ones. The appearance of toughness, or a reality show facsimile of toughness, seems to matter more than any of our values." In the book -- "The Restless Wave: Good Times, Just Causes, Great Fights, and Other Appreciations" -- McCain also writes that he regretted picking former Alaska Gov. Sarah Palin as his running mate on the GOP presidential ticket in 2008. He writes that he wishes he hadn't let campaign advisers talk him out of selecting former U.S. Sen. Joseph Lieberman, Al Gore's running mate on the Democratic ticket in 2000, as his running mate in 2008. Senator John McCain, a Republican from Arizona, speaks to the media after leaving the Senate floor in Washington, Feb. 12, 2014. In addition to his memoir, HBO announced in April that it is working on a documentary about McCain's life and that the senator has agreed to participate in it. 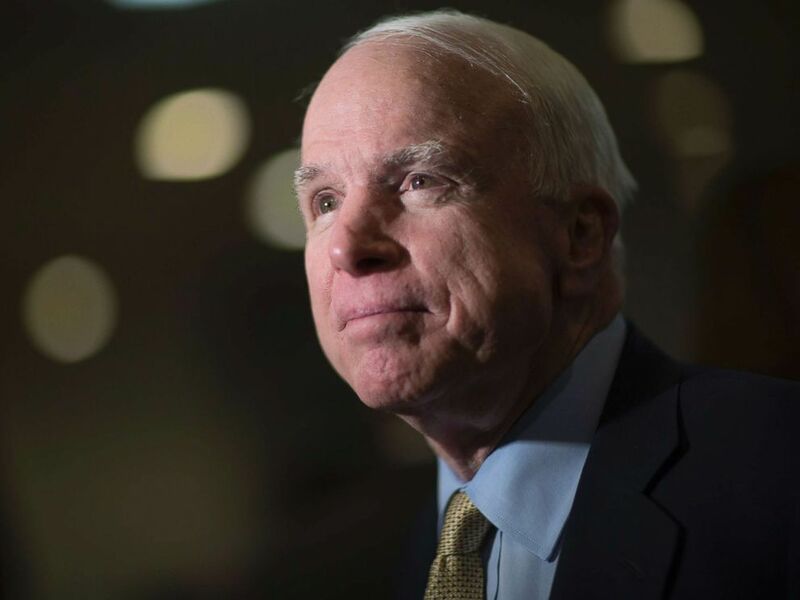 In his book, set to be released on May 22, McCain also writes, "I don't know how much longer I'll be here," according to an audio excerpt released on Thursday on NPR's "All Things Considered." "Maybe I'll have another five years, maybe with the advances in oncology they'll find new treatments for my cancer that will extend my life," McCain says in the excerpt. "Maybe I'll be gone before you hear this, my predicament is, well, rather unpredictable. But I'm prepared for either contingency or at least I'm getting prepared. I have some things I'd like to take care of first, some work that needs finishing and some people I need to see, and I want to talk to my fellow Americans a little more if I may."